Unique industrial design sets this collaborative table apart from the rest! Gorgeous, quality-made solid wood tables tops are available in 3 finishes/wood species and in a variety of sizes. 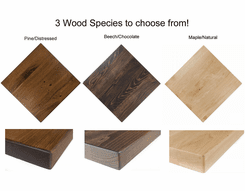 1-3/4" solid wood tops are made in the USA ! The parsons leg steel frame features an extremely solid and functional design with its recessed center leg for ample user leg space. Expandable table frame allows you to add table sections as your company grows! 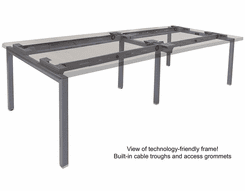 Table frame also features built-in cable troughs and access grommets for those who wish to install their own power/data. 9' table sold above. See other sizes sold below. Measures 108 "long x 48" wide x 30-1/4" high overall. Includes three 3' x 4' table tops with six leg parsons leg frame (center legs recessed). Seats a maximum of 8. Shipping weight: Maple or Beech 299 lbs. / Pine 188 lbs. Ships unassembled for safety in transit. PRICE INCLUDES SHIPPING! (Truck shipment - see Terms & Conditions). IN STOCK! * Beautifully built tops are constructed using mixed width staves from 2" to 4" for a clearly handcrafted appearance. * All tops are hand-sanded and finished with a durable and easy to maintain two part acrylic polyurethane in a matte sheen. 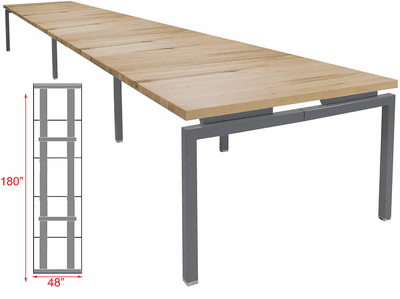 * Sturdy steel framework with recessed center legs and built-in cable troughs. * Frame adjusts in size to adapt to varying size table tops. * Modular tops allow you to expand if needs change in the future. 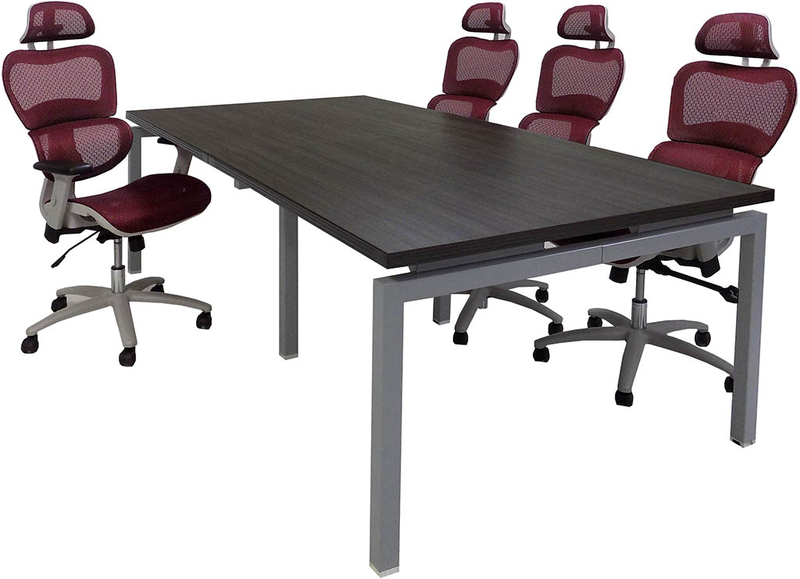 * All metal table frames feature a modern silver finish with adjustable leveling glides. 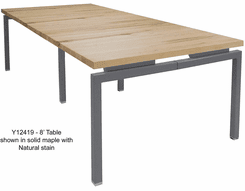 * Table tops mount securely to frames with self-threading wood screws for a solid and substantial feel. Choose from 3 handcrafted solid wood table tops. 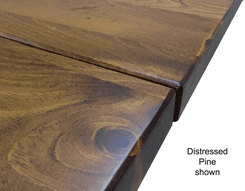 Distressed Pine will vary in color from medium to dark brown with some knots and wavy, curly and straight grain. Hand-sanded to leave a smooth writing surface with variety of distress marks for character. Maple grain is generally straight to wavy. Natural finish will vary in color from blond to honey. Hand-sanded to leave a smooth writing surface. Planks have a few knots with mostly straight grain. 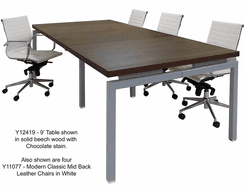 The chocolate color stain gives the Beech tops a medium to dark brown color with minimal color variation. Hand-sanded to leave a smooth writing surface. Measures 144" long x 48" wide x 30-1/4" high overall. 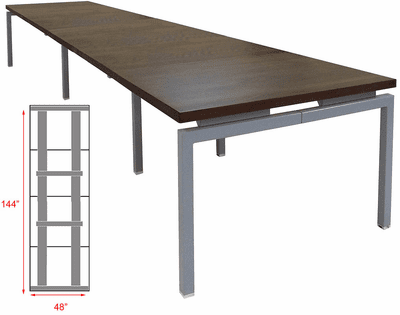 Includes four 3' x 4' table tops with eight leg parsons leg frame (four center legs recessed). Seats a maximum of 12. Shipping weight: Maple or Beech 394 lbs. / Pine 296 lbs. Ships unassembled for safety in transit. PRICE INCLUDES SHIPPING! (Truck shipment - see Terms & Conditions). IN STOCK! Measures 180" long x 48" wide x 30-1/4" high overall. 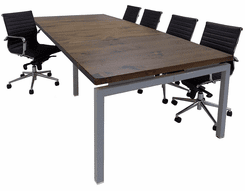 Includes five 3' x 4' table tops with eight leg parsons leg frame (four center legs recessed). Seats a maximum of 14. Shipping weight: Maple or Beech 489 lbs. / Pine 304 lbs. Ships unassembled for safety in transit. PRICE INCLUDES SHIPPING! (Truck shipment - see Terms & Conditions). IN STOCK! Adds 3' table length to any of the above tables. 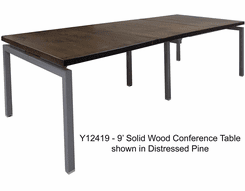 Includes recessed leg support extension and all hardware needed to extend your Parsons Leg Conference Table. Shipping weight Maple or Beech 99 lbs. / Pine 63 lbs. Ships unassembled for safety in transit. PRICE INCLUDES SHIPPING! (Truck shipment - see Terms & Conditions). IN STOCK!